Five Feline Fancies, a collection of five cat stories kicks off with The Secret Lives of Cats, a story about a science writer who attaches little cameras to his cats to find out where they go during the day. When he uploads the kitty pics he discovers more than he bargained for. There is murder and a macabre new meaning to NIMBY or not in my backyard. The rest of the stories include the quirky fantasy The Poop Thief which blew my mind. I’d never thought of cats existing in this kind of fantasy realm and if you like this genre, you’ll love it. Only a true cat lover could have written the the crisply written and witty mystery, What Fluffy Knew from a cat’s perspective. All the writing is as good as it gets making this cat lover purring with delight. The author and Monet, her feline muse. Our wise old boy Merlin, gives Five Feline Fancies his highest 4 Paws Rating. 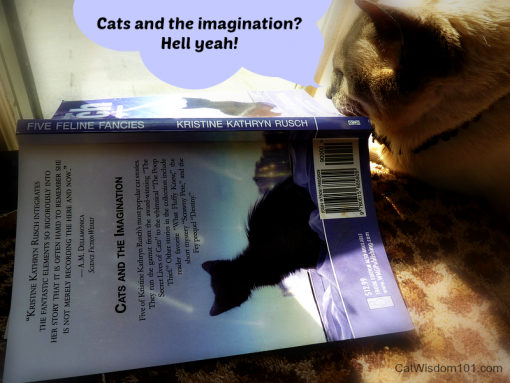 If you’d like to win a hard copy of Five Cat Fancies, simply leave a comment before April 5, 2014,11.59 pm ET. If you’d like extra chances to wins, social media share and tell us in a separate post where you shared. Would love to have a copy! I was just reading her business blog where she was talking about here. Great! Secret Lives of Cats is one of my favorite stories! Looks like another good collection from one of my favorite multi-talented authors. I would very much like to have a copy. I’d love to win this! Right up my alley, love those genres! Looking forward to being in a better headspace to read these. My cats will read it with me! Love to read more of Kris’s cat stories. Sounds like a really fun read! 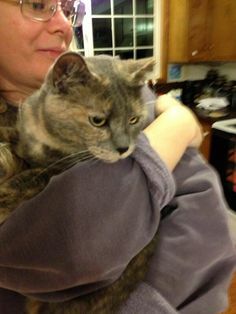 I pinned on PInterest on the Cats board. I would love to win as I love reading cat books and this looks like a great addition to my cat library. Cats and books! Life is good! That looks like a great read. I love cats and books ! This book sounds WONDERFUL! I must tell the peep about it, ASAP. We think sci-fi cats is a grand idea too! Layla sorry you could not leave a comment yesterday. I don’t know why that would have happened, no changes at all to the settings. Just a Blogger blooper I suppose. I know occasionally I have seen other say they have been unable to leave comments on different blogs for no reason at all. Sci-Fi and cats! Oh my we have surely swooned with Joy! 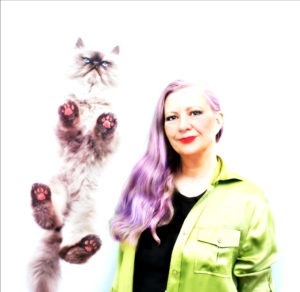 Five Feline Fancies by Kristine Kathryn Rusch sounds wonderful! We love all types of books. Thank you Layla for another great contest! Happy Day to all and good luck!!! I am still waiting to receive the Rescue Remedy gift that I won in December. I have e-mailed about it and received no reply, so I thought I’d try posting here. Thank you. I’m a science fiction fan. Ms. Rusch pens a fine yarn. I haven’t read these, so I’d be thrilled to receive this book. This sounds like a good book! Thanks! I am a scifi/fantasy reader so I’d love to read this book. Oooo! My human would love to win this – it is the type of thing she really enjoys! Count me in! I’d love to read this!